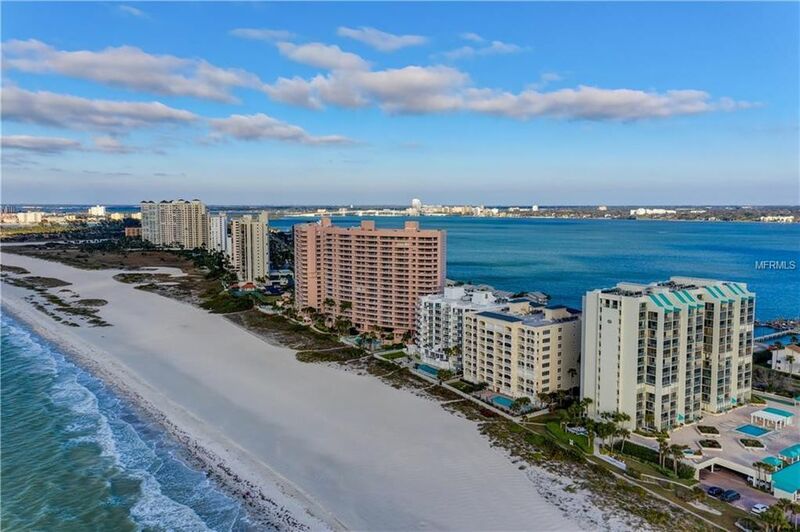 Luxurious home w/panoramic views from all rooms in the sought after Bella Rosa Condos in the coveted Clearwater Beach area. This masterpiece boasts appointments throughout including a semi private, secured elevator entrance into an impressive vestibule area to the double door entry into the grand foyer, chef's gourmet kitchen w/new stainless steel appliances, tray ceiling , maple cabinetry, pearl nickel fixtures, granite countertops, center island and breakfast bar, recess and under the counter lighting , vast family room w/morning bar area w/granite countertop and quad sliders leading you to the expansive balcony w/sweeping views of the ocean, immense master bedroom offers walk in closets, plush carpeting, custom ceiling fan w/light kit and gracious sliders to the balcony, master bath w/garden tub, dual sinks, maple cabinetry, custom lighting, make-up sitting area and walk in shower, en suite guest room w/intracoastal views via your generous terrace, secondary bedroom w/plush carpeting, stylish custom paint and wondrous views. The community offers resort style amenities including a fitness center, tennis court, oceanside pool and spa area w/grills and private access to SAND KEY BEACH and more!